If you don't have your previous save file, you can choose a pre-made option or create a new custom history for Eora. There are multiplayer layers of quests in the original Pillars of Eternity and there are a ton of different things that could happen in Pillars of Eternity 2: Deadfire depending on the decisions that you made as a player. At the beginning of Pillars of Eternity 2: Deadfire, the Watcher's body is destroyed by the awakening God Eothas. Players take control of the Watcher in the in-between and, at the end of this journey, must decide what happened in the original Pillars of Eternity. Here's your guide on how to import your save file from the previous game or create a new custom history if you're not happy with the pre-made options. 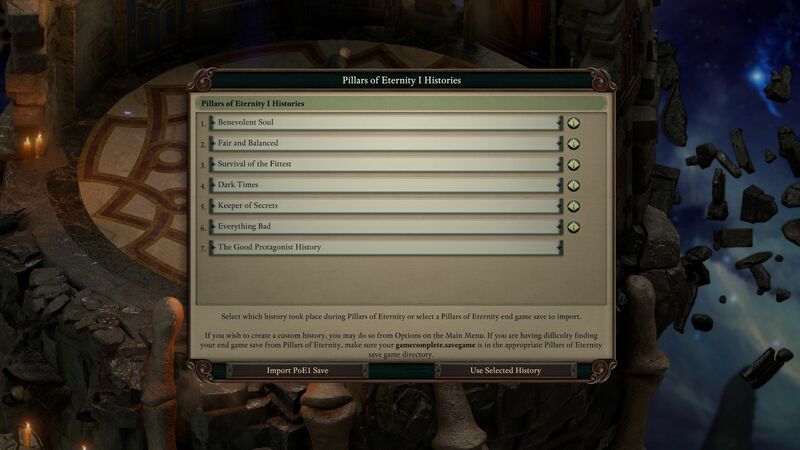 To import all of the decisions you made in the original Pillars of Eternity, start a new game. After you guide your spirit form through an area in the in-between, you'll meet an aspect of a god and be guided to a table where you sit down with another god. That god has cards laid out before here and asks for you to tell your story. At this point, you're allowed to choose your Pillars of Eternity history and, to the bottom left, you'll see "Import PoE1 Save". "In Pillars of Eternity, you returned the lost Hollowborn souls to the Dyrwood's children, as you had pledged to Hylea. You were kind and merciful to people you encountered, sympathetic to their plan and charitable to those who needed help." "In Pillars of Eternity, you returned the lost Hollowborn souls to the Wheel, as you had pledged to Berath. Most other choices were judicious and balanced, tempered by rational thought and fairness rather than sympathy or emotion." "In Pillars of Eternity, you used the souls of the Hollowborn to strengthen the Dyrwood, as you had pledged to Galawain. Most other choices were made to strengthen you and your allies while punishing and weakening your enemies." "In Pillars of Eternity, you consigned the souls of the Hollowborn to oblivion, as you had pledged to Rymrgand. You left a wake of physical destruction and spiritual annihilation wherever you went, seeking to bring a final end to all things." "In Pillars of Eternity, you pledged the souls of the Hollowborn to oblivion, as Rhymrgand requested, but you ultimately gave the souls to Woedica. You supported maintaining the gods' secrets as well as your own." If you don't have a save file from Pillars or would simply like to make some different choices this time around, you have options. When you start a new game, there are premade options across the moral scales that will have decisions made based on how you'd like to be perceived when you first step into Pillars of Eternity 2: Deadfire. If you'd like more control than that, you can use that same system and make a custom Pillars of Eternity history before starting your game. In order to this, click "options" on the main menu. Then hit "Set PoE1 Game Stats" on the bottom left. This takes you to a list of custom histories. Don't be too concerned if you don't want to involve yourself in more minuscule choices. You can even skip the White March DLC history if you're not familiar with it. The only required decisions involve The Hollowborn Crisis, which is the main conflict that the first Pillars is built upon. If you want few history lessons before diving into these options, read up on our Culture, Origin Locations, and Bonuses guide or the Races, Subraces, and Attribute Bonuses guide. Once you're ready, dig into the menu options, all the way down to which of the first game's companions lived or died, and then get ready to start your journey into Pillars of Eternity 2: Deadfire. After you etch the history of Eora into stone for your journey, head on over to our full Pillars of Eternity 2: Deadfire walkthrough and guide for tips on creating your new Watcher, catching up with the companions that survived in your history, and more.